My quilts tend to be inspirational or nostalgic. Sitting on the Porch on a Southern Summer Night is nostalgic. Growing up in small town, there was nothing else to do on a summer night but sit on the porch, swat mosquitoes and gossip. Those were times when everything moved slower. This quilt made me wonder what the non-human things were doing in the yard while the people were sitting on the porch. Apparently, they were enjoying themselves too. The appliqué and the quilting in Sitting on the Porch on a Southern Summer Night is done by machine. The quilt is embellished with buttons, crystals and decorative stitching. 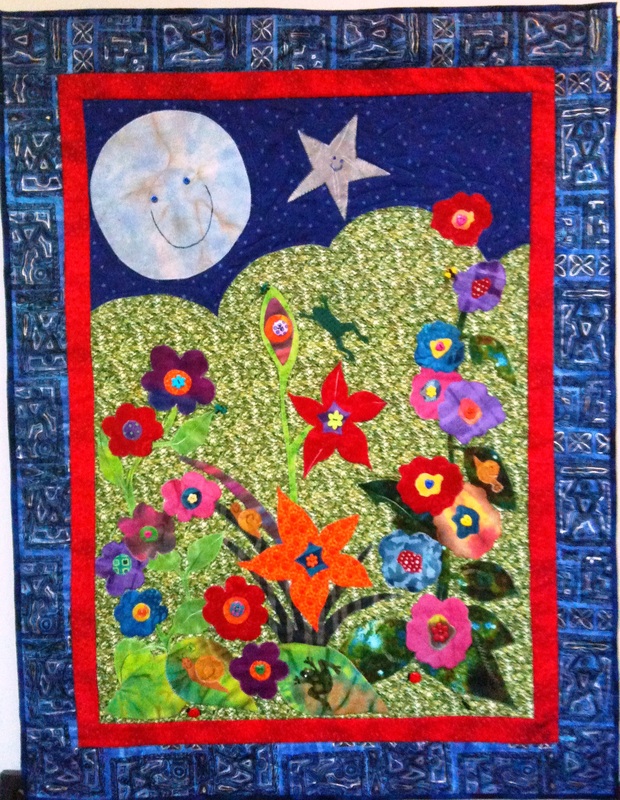 Metallic thread and crystals in the background of the quilt catches the light of the moon. There is a hanging sleeve on the back of the quilt for easy display and a label that documents the quilt. This one-of-a-kind quilt measures 30 x 40 inches. I signed it on the front. If purchased, this quilt is not available for shipment until August 15, 2011 because it is being exhibited in the 2011 Atlanta Quilt Festival until then. This entry was posted in A Quilter's Life, For Sale, Places to See My Quilts and tagged 2011 Atlanta Quilt Festival, African American quilter, O.V. Brantley, Sitting on the Porch on a Southern Summer Night, wallhanging, www.ovbrant.etsy.com. Bookmark the permalink.